...... I 'borrowed' these fabby photos from CathyC of her gorgeous grandchildren. I love scrapping them as they're the most adorable beautiful babies. 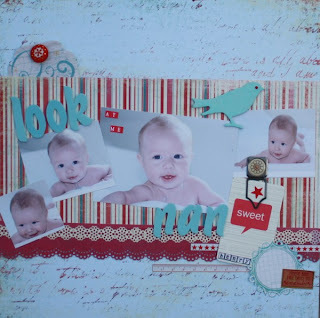 The first layout of Henry is using MME papers from Sarahscards (which are in her HUGE sale) together with AC thickers, 7gypsies paperclip, Jenni Bowlin embellies, Adornit mini-alphas and a few other bits and bobs. 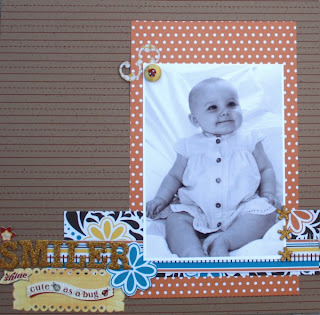 The second layout of Olivia is using the newly released lush Pebbles Inc. Downtown papers from Sarahscards. The alphabet is AC thickers, the background card is also newly released, but is from the Kraft range by Jillibean Soup, and the few embellies are K&Co cute as a bug. Here's my idea for the 2/11 challenge. I'd bet that this week and next, lots of people are helping their kids get ready to celebrate Valentine's Day at school. Most of these events involve the little store bought cards that are about ATC size with a cute image and a coordinating short, funny/catchy saying. For this week's challenge, come up with a tiny Valentine along these lines--one image, bright and colorful, Valentine-ish sentiment. Maybe you'll even be inspired to make some for your kids to exchange with their friends . . . I'm attaching a printable sample of the kind of cards I'm thinking about in case anyone is unfamiliar with them. As a kindergarten teacher, I'm much more familiar with these little things than I care to be . 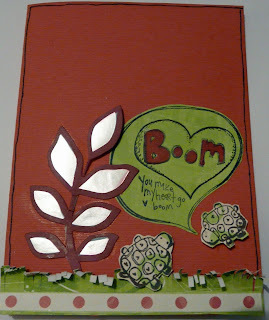 . .
Soooooooooooo I used red bazzill cardstock and rhonna farrer merry & bright papers - together with a new release Unity stamp called Boom Goes My Heart - so cute !!! Will defo, defo, defo promise to start uploading photos from France .... and ... some fabby new papers from CHA !!! YAY !!! I'm back into the fold .... and this weeks challenge was set by me !! Make a valentine card using a stamp you wouldn't usually use, use ribbon and buttons. I've just remembered that I haven't used buttons - oh poo and pants ! 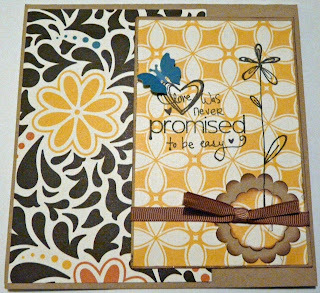 Papers are the new Pebblesinc that have just been released at CHA and are the Downtown range, and will shortly be in the UK via http://www.sarahscards.co.uk/. Stamps - are obviously Unity - yay !!!! Don't forget to check out the Unity Hip Hop on Thursday. Catch y'all soon with photos from France - and some exciting news !